Happy 100th post! This is officially my 100th post to the blog, which blows my mind quite a bit. It all started almost 4 years ago with the big study abroad trip to Spain. Who knew that I would be where I am now, writing about grad school, hockey games, and traveling. I was hoping the topic of my 100th post would be a bit more..meaningful, but continuing in chronological order, it’s a hockey game. I guess this will show how fun Cade and my life have been over these past few years. 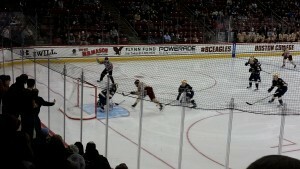 So, in celebrating the 100th post of Breathe Life, here is the Boston College vs. Notre Dame hockey game that we went to. 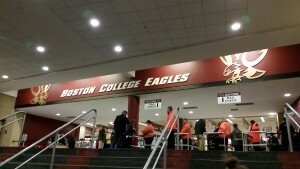 Continuing with our check list of attending a hockey and football game at each of our colleges, Cade and I went to the BC vs. Notre Dame game back in December. Not only were we finally able to go to one, it was perfect timing as it was on the evening of my last day of classes. The only thing that stood in the way of completely finishing the semester was one paper. It ended up being a really difficult and frustrating research methods paper, completely about statistics, but that is now done and over with now. One thing that was particularly funny..maybe a little ironic..about this day, also, was that a recent outbreak of the norovirus had been spreading on campus. You might have heard about it since it made national news, it was one of the many issues with Chipotle food that’s been happening. They linked all the cases to one of the locations close to campus. So, it was a little icky being on campus and worrying about keeping our hands clean. But, after arriving at the stadium, we got into the game soon enough. It’s kind of amazing to me how quickly the group mentality and team spirit can travel. On any other day, I’m not a huge fan of much college sports, but being at your college, watching the team and everyone get excited, it’s hard not to be bitten by the team spirit bug. As I mentioned, BC was playing Notre Dame, and with Cade’s heated grudge that he holds with them, we were especially in the mood to see BC take them down. And, at some point during the game, Cade and I engaged in our usual game of Where’s Baldwin. As I’ve said before, half of the fun is just watching Baldwin and trying to find him in the crowd. This time was particularly entertaining as he broke out some fiddle playing dance when The Devil Went Down to Georgia came over the speakers. 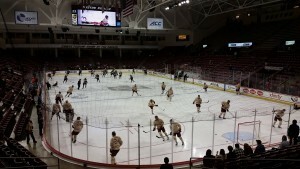 In the end, BC fell 3-4 against Notre Dame, but they kept things interested, and as usual, we had a good time. It was a very nice way to wrap up the semester and support the Eagles. Yay 100 posts and sideways Baldwin!